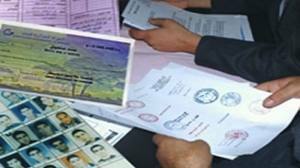 The Kurdistan Region’s Higher Education Ministry has linked over one hundred and fifty fake certificates to university students since October. Local media now claim that an advisor to Kurdistan’s prime minister paid over one hundred thousand dollars for a fake high school diploma. Bapir Bakir heads a government department that investigates forged certificates. He says Kurdistan’s government is getting tough on the issue. Ironically, officials have discovered three fake certificates belonging to Education Ministry employees. Ministry staff member Awat Mejid Barzinji told Press TV that there are people who bring fake certificates and ask ministry officials not to answer the certificate request until the person has finished the process of starting work. Barzinji also told Press TV that fake certificates are discovered when government employees are promoted. She said promotions happen every day in Kurdistan’s government. She also explained that some people who study in central and southern Iraq have fake certificates. But it’s only when they transfer their job to Kurdistan that fake certificates are discovered. A government decree should give a reward to anyone who exposes fake official documents. But officials say they have not received any rewards. Many believe that fake certificates are a sign that Iraq’s education system is not educating people properly. Fake certificates also highlight the partnership that exists between education authorities in Erbil and Baghdad. Officials say both sides are cooperating to eliminate fake certificates.